Embedded water is everywhere, from the shirts we wear to the cereals we eat, not to mention beef. Less well-known is the water that transits through electricity grids, that is, the water used to generate electricity that “flows” in the grid from electricity production regions to electricity consumption ones. A recent article sheds some light on these hidden water flows, and, as in the case of international trade, sub-optimal configurations prevail: China’s dry provinces feed relatively wetter provinces with water-intensive electricity. The development of long distance transmission lines might reinforce these outflows of scarce water, further exacerbating local water issues in these provinces. China is a country of geographical mismatch; this is especially true on the energy front. 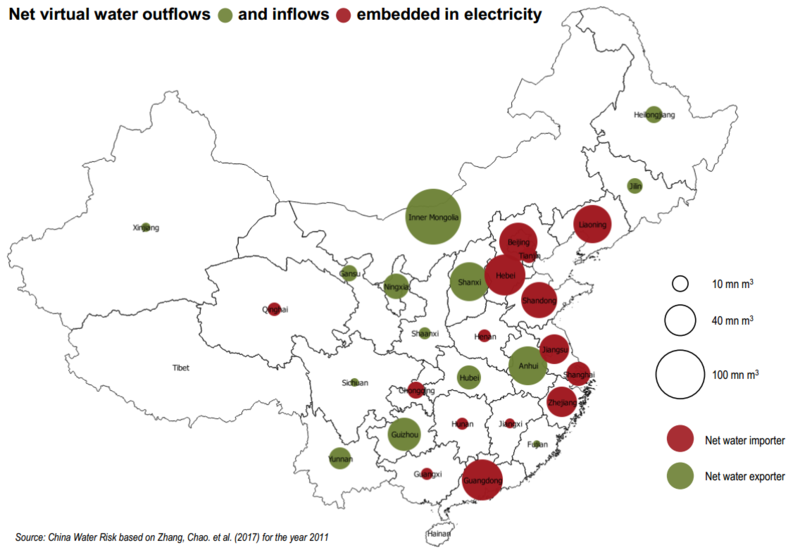 Coal and hydropower resources, the main sources of China’s electricity, are located far from urban electricity clusters where a growing share of electricity is consumed. Most of China’s coal (85%) is mined in fifteen Northern provinces. Given that electricity often proves easier to move than coal, many thermal power plants are located in these same regions, raising tensions with limited water resources (these same fifteen provinces only account for around 15% of China’s freshwater resources). In contrast, hydropower generation mainly lies in South and Southwestern regions, with Sichuan, Yunnan and Hubei representing almost 60% of China’s hydropower generation. As a consequence, Northern/Northwestern as well as Southern/Southwestern provinces are mainly net electricity exporters whilst coastal regions are net electricity importers, as shown in the map below. Coal is a relatively thirsty source of power generation, especially when it is located in inland provinces where it cannot rely on seawater for cooling. 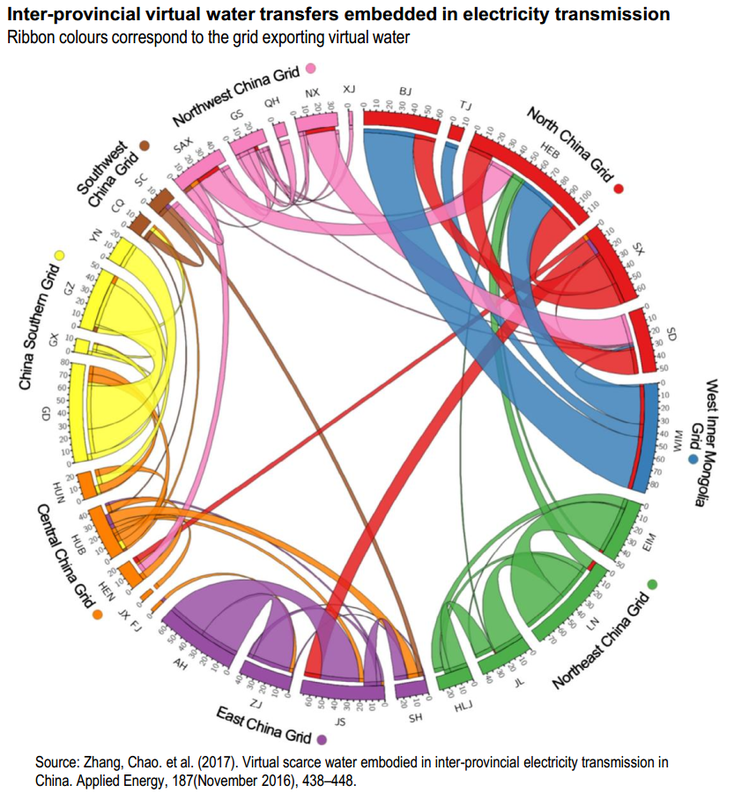 As a result, each electron “generated” by a coal power plant comes with its associated water consumption, and interprovincial electricity transfers translate into interprovincial virtual water flows. Water withdrawal is the water removed from the ground or diverted from a municipal source for use in the plant. Water consumption refers to the portion of the water withdrawn that is not returned to its source, mainly because of evaporation or incorporation into products. The water withdrawn that is not consumed is therefore discharged and requires some specific treatment. 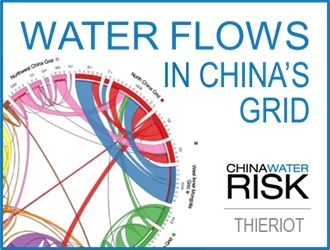 Read more about water and energy in our report Towards a Water & Energy Secure China and our brief co-published with IRENA. Given the dominant role played by coal in Northern provinces and the water intensity of coal-fired power plants, these net electricity exporters regions automatically become net water exporters of water through the electrical grid. A recent study by Chinese and American researchers looked precisely at these virtual water flows. Based on this study’s results, the map below shows the provinces exporting and importing virtual water embedded in electricity. This resonates with Professor Hoekstra’s view that cities, or more generally urban areas, are by definition unsustainable – read our interview with Professor Hoekstra here. For instance, around 60% of the water footprint associated with Beijing’s electricity consumption comes from other provinces, namely Inner Mongolia and Shanxi. This should put into perspective recent media headlines that praised Beijing city for closing its last coal power plant. The diagram below, directly extracted from the same study, further details these inter-grid and inter-provincial flows. Inner Mongolia (combining West and East Inner Mongolia) is the largest exporter of virtual water. The total outflow of virtual water is around 130 million m3. Other major exporters include Anhui, Shaanxi, Guizhou, Ningxia and Hubei. 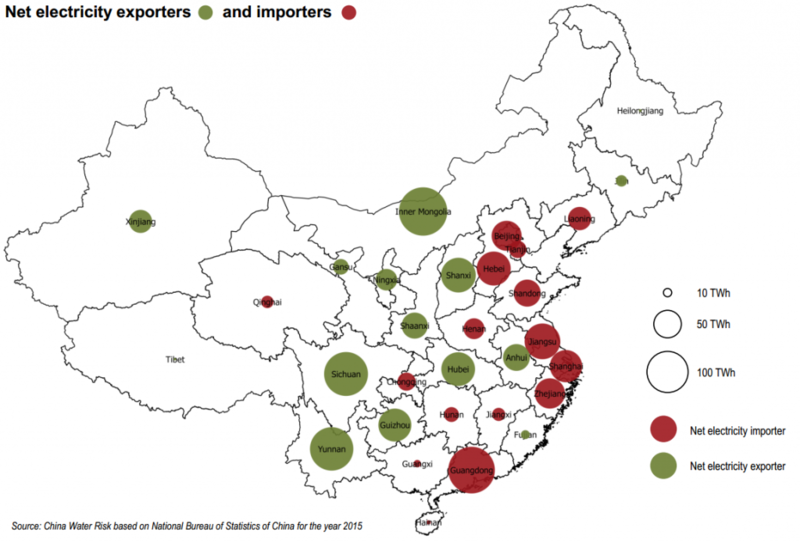 Hebei, Guangdong, Beijing and Liaoning are the largest importers. More than half of inter-provincial virtual water transfers happen across sub-national grid networks. This highlights the role of long-distance transmission lines and the ability they grant to outsource the pressure on resources (and air quality) to ever more remote provinces. Overall, inter-provincial virtual water transfers account for around 13% of the national thermoelectric water consumption. In the study, authors also adopt a “scarcity-adjusted” measurement of virtual water. The underlying assumption is that a drop of water in a water-stressed province should count for more when the local water stress is higher. Surely this approach is to some extent arbitrary – see Prof. Hoekstra’s opinions on water stress-adjusted LCA analysis. However, it can prove useful to highlight the flows of scarce water i.e. sourced from water stressed provinces – see the updated chart below. 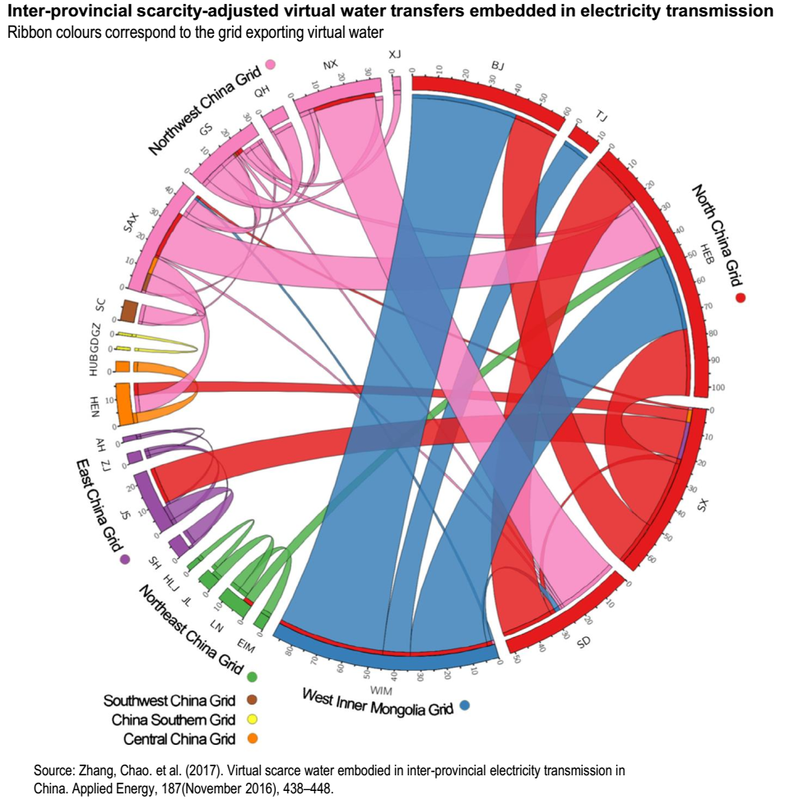 Results clearly show how Inner Mongolia, Shanxi, Gansu and Ningxia, despite being highly water-stressed, export scarce water through the electricity grid. Beijing, Hebei and Shandong are the three largest destinations of this scarce water. This kind of study sheds light on the hidden water that lies virtually everywhere, and the need to consider the associated constraints when devising energy and food policies. With the expected development of long-distance transmission capacity, especially from West to East and from North to South, the pressure on North and Northwestern water resources might grow even further. This further stresses the need to reduce renewable energy curtailment in Northern provinces. The irony is that three out of the four largest exporters of “scarce water” through the electricity grid (namely Inner Mongolia, Gansu and Ningxia) also belong to the five provinces with highest curtailment rates of wind power. With the water footprint of wind and solar PV power generation being substantially lower than thermal power, addressing curtailment would also help curb the pressure on local water resources. Hubert now only works on web development for CWR, having transitioned away from his role in the water & energy space, which included driving the water risk valuation conversation for the energy sector. Engagement with multiple stakeholders at CWR has led him to explore for-profit solutions in addressing challenges in Environmental Risk Analysis. He now spearheads Environmental Risk Profiler (ERP), an independent online solution to identify, monitor & anticipate environmental risks, with which CWR may work with on a project basis. Previously, Hubert spent several years in Beijing, where he conducted research for the International Institute for Sustainable Development as well as the Chinese Institute of Engineering Development Strategies (CIEDS) on international energy efficiency policies, low-carbon policies and China’s future trends including the circular economy. In a previous life, Hubert researched and lectured on energy in European and Chinese institutions, including Mines ParisTech, the Swiss Federal Institute of Technology of Lausanne (EPFL), and Huazhong University of Science and Technology. He holds various degrees in mechanical engineering, philosophy and public policy.